The second book of the Destiny series, Destiny’s Whirlwind is scheduled for release on April 17. You can imagine my joy on seeing this wonderful article written by Elise Shire of The Oxford leader! An award-winning Addison Township author is preparing to release her sixth novel. Brakefield’s latest contribution to the literary world is entitled “Destiny’s Whirlwind” and it’s the second part of a thrilling four-part series. The novel is set to be released on April 17 through CrossRiver Media Group. According to a recent press release, “Collina McConnell is thrust from adolescence to adulthood as she promises her dying father she will manage their estate – but her father dies before disclosing the mystery behind his legacy for Shushan [the estate]. The events within the novel, which is a historical romance, take place just before the Spanish-American war and span through 1898. According to Brakefield, the struggles which the McConnell family faces throughout the Destiny series mirror the struggles and perserverance which have been shown by past generations of American leaders, like former U.S. President Theodore Roosevelt. “History, and historical romances, are really about the past shaping our future. I think that is what my Destiny series portrays,” said Brakefield. She added that she hopes her upcoming novel will help inspire readers to face life’s challenges with similar fortitude. Brakefield is set to hold book signings at Beadifferent Boutique (7 North Washington St.) in downtown Oxford on May 12 from 1 to 4 p.m. and at the Addison Township Public Library (1400 Rochester Rd.) in Lakeville on May 17 from 6:30 to 8 p.m.
Brakefield will be featured on Write Stuff Radio Station with Parker J. Cole on April 24. She will also host book signings at Hidden Treasures in Altoona, Iowa on April 26; at Grace Central Church, Omaha, Nebraska on April 28; at Faith Book Store in Flint May 5 from 1 to 4 p.m.; and at Shiawassee District Library in Owosso, MI on May 10. Brakefield is also the author of the faith-based historical romances “The Wind of Destiny” and “Wilted Dandelions,” which received two awards. She has written two pictorial history books: Images of America: The Lapeer Area, and Images of America: Eastern Lapeer County. 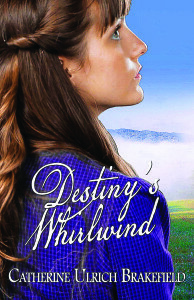 Upon release, “Destiny’s Whirlwind” will be available on Amazon.com and at CrossRiverMedia.com. To learn more about Brakefield and her previous works, visit catherineulrichbrakefield.com. This Mother’s Day give Mom a present she can continuously reopen. Here are a few great places to find that special gift. Beadifferent Boutique. Located on 7 North Washington St. in downtown Oxford. I will be there on May 12 from 1 to 4 p.m.
Hidden Treasures; 100 8th St. SE F; Altoona, Iowa 50009 on April 26 from 1 to 4 p.m.